Motorcycles are 2-wheel vehicles patterned after bicycles but with much heavier frames. Early motorcycles were actually bicycles fitted with small internal combustion engines. There was a gradual evolution as numerous motorcycle manufacturers entered the market and competed against each other. How a motorcycle works is mystifying to many wanting to ride. Motorcycles have complex controls that are operated by both hands and feet and require coordination and skill not required to drive an automobile. In fact, people starting to learn to ride a motorcycle without ever having ridden a bicycle or driven a stick-shift car, may be at a disadvantage when trying to learn to ride. Motorcycles have been a part of transportation for a very long time. They were once much more prevalent than automobiles until such pioneers as Henry Ford found out how to mass produce cars at a price below that of motorcycles. Over the years, motorcycles have come to fit a variety of needs beyond basic transportation. 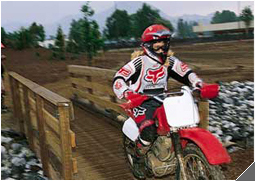 Today's rider may use a motorcycle for commuting or everyday use. Some riders use their motorcycle for basic transportation and don't own a car. Some ride a motorcycle as part of their lifestyle. Some ride motorcycles only on weekends. Some ride on lengthy cross-country tours. Some even travel around the world on adventures. Motorcycles have evolved to include 3-wheel vehicles called trikes. Motorcycles are sometimes fitted with a sidecar to allow whole families to enjoy motorcycling. In the United States, only one company, Harley-Davidson, has been able to survive, producing models every year since its first model in 1903. In fact, to most non-motorcyclists, the words "motorcycle" and "Harley-Davidson" are used interchangeably. Although many brands exist, the most prominent besides Harley are Honda, Yamaha, Kawasaki, Suzuki, BMW, and recently Victory and a revitalized Indian. Unfortunately, Indian closed its factory in Gilroy, CA on September 19, 2003. The 380 Indian employees at the plant were told that a deal with a new investor had fallen through. A motorcyclist can be created at any time. It's often a matter of timing. Some learn when they're young and grow up with it. Others get the urge later in life. The bug bites them and they can't get rid of it. They're hooked. Some want to learn but are constrained by family members who declare: "Motorcycles are dangerous. I know somebody who almost got killed on one." Maybe it's your wife or husband who doesn't want to see you get hurt. More likely, it might be that you now have kids to care for and your spouse decries: "Motorcycles will just have to wait." Everyone has a story why they can't ride but wish they could. The truth is that if you have the bug within you to ride a motorcycle, you will find the right time to take up motorcycling. No amount of pressure from friends, family, or society will deter you from participating in motorcycling. Look for the right time and "Go for it!" © Copyright 2010 Chengfeimotor.com All rights reserved.